On our last night in L.A. we stayed in West Hollywood. On our way out to dinner that night we bumped into the Dyke March on Santa Monica Boulevard, right down the street from our hotel. We cheered on the sideline and waited for the short, but cheery parade to pass. 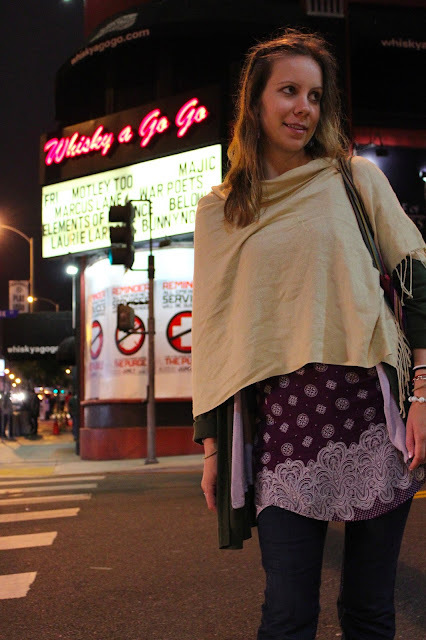 We continued our walk along the Sunset Strip to see some famous rock clubs such as the Whisky A Go-Go (opened in 1964) and The Viper Room. Husband and I are both long-time Doors fans so we wanted to see as much Doors history as possible. The Doors was the house band here for a while — until the debut of the "Oedipal section" of "The End" got them fired. The Viper Room opened in 1993 and was partly owned by actor Johnny Depp until 2004. The club became known for being a hangout of Hollywood elite, and still is, and was made notorious as the site where actor River Phoenix died of a drug overdose in 1993.